The American Cancer Society is having their Daffodil Days fundraiser, and my work bought some for everyone in the office. Yesterday, I brought several of them home (as they're going to wilt all alone at the office over the weekend), and the kids love them. Jake's been smelling them and Reed likes to carry a vase around the living room. 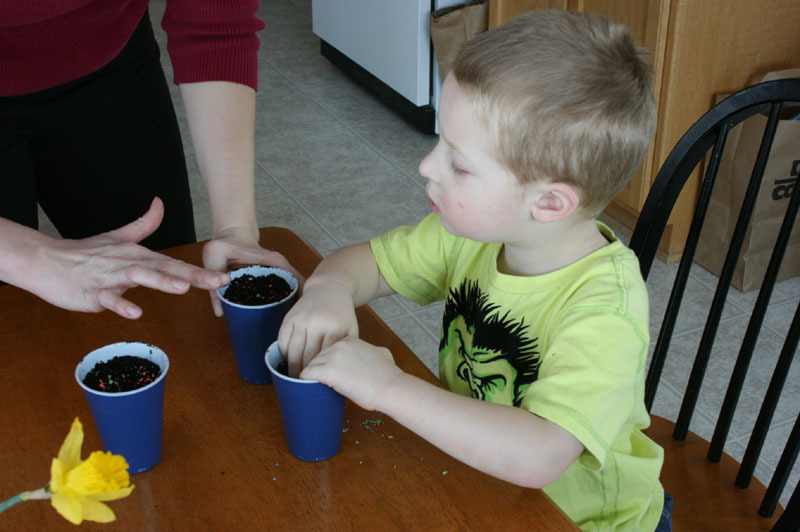 Jacob was really excited to plant and water the seeds. Reed was more interested in seeing how they tasted. We made four plastic cups -- one for each of us. They're sitting on our windowsill above the stairs, hopefully starting to grow. In a few years, when the kids are old enough to know not to touch them, we may be able to put them in a sunnier spot like the living room. In the meantime, we'll be checking our flowers every day, and I'll try to keep taking pictures.